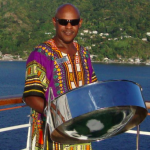 ROBERT SYMONS Steel Pan Soloist, Recording Artist, Bass Guitarist is from the Island of Bermuda. 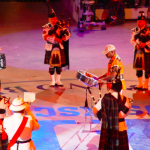 2003 Edinburgh Military Tattoo Edinburgh, Scotland, Steel Pan Soloist Guest Artist played to Capacity audiences of 1/4 million. 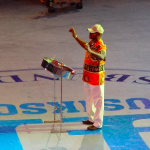 BBC TV broadcast the event to a viewing audience of 100 million across the world. Café Sito in St. Thomas was Robert’s first gig as a solo steel entertainer in 1995 and he established himself there for 2 years as Tropicana Steel Pan before returning to Bermuda. 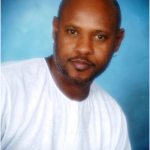 Jazz harpist and bass on the Hotel and Restaurant Circuit in St. Thomas and Puerto Rico. Resident bass player at Blackbeards Castle Hotel performing with jazz singers and piano accompanists from the US mainland. Regular bass guitarist at the famous Barnacle Bills Rock and Roll Club. Resident bass player at the Secret Harbor Hotel that hosted the “jazz cruise brunch” for many famous jazz musicians and entertainers that were performing on board the cruise ship “The Norway”. Performed with legendary jazz pianists Dorothy Donagan and Dave Brubeck. 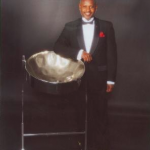 Played bass with numerous steel pan players on the St. Thomas and St. John hotel and restaurant circuit.